D.C. 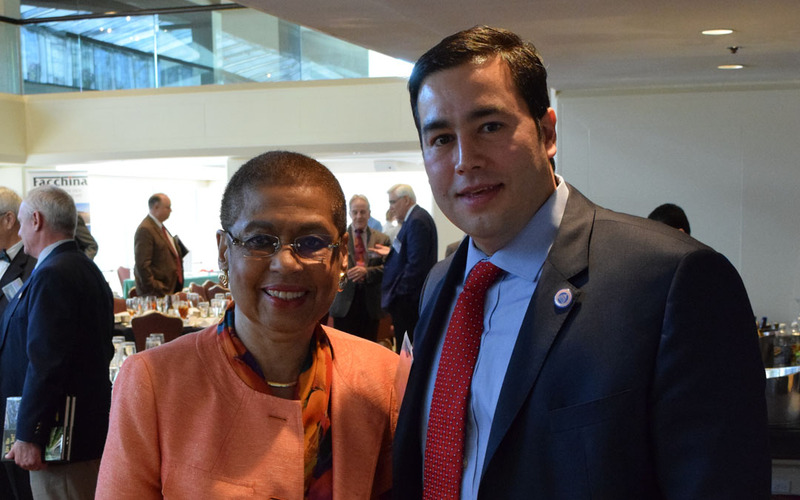 Delegate Eleanor Holmes Norton (D) and MWRTBA Executive Director Mike Sakata. The five-year, Fixing America’s Surface Transportation (FAST) Act signed into law this month was the result of a tremendous bipartisan effort by Congress, but was also a “tremendous trade off,” Delegate to Congress Eleanor Holmes Norton (D-D.C.) told more than 80 members of the Metropolitan Washington Road & Transportation Builders Association (MWRTBA) at a Dec. 16 luncheon. Norton said in order to achieve annual funding increases over the course of the legislation, members had to shorten the length of the bill to five years from the original six-year proposal. “I’m very happy to be here after finally getting a long-term transportation bill in which we were able to keep money in transportation and transit in this area. But we need to continue to keep the pressure on and that pressure can’t just come from me,” Norton told the group. She said more work needs to been done to fix the Highway Trust Fund, a sentiment echoed by ARTBA leaders following the passage of the FAST Act. ARTBA noted that Congress and the Obama Administration sidestepped a golden opportunity to put the federal highway and transit investment program back on solid financial footing for the long-term. Norton, who has represented the District of Columbia in Congress since 1991, serves as the Ranking Member of the House Subcommittee on Highways and Transit. She also serves on the Committee on Oversight and Government Reform and the Committee on Transportation and Infrastructure. DC Water General Manager and CEO George Hawkins also was a guest at the annual holiday luncheon. MWRTBA represents contractors, subcontractors, materials suppliers, engineering firms, law firms, accounting firms, bonding and insurance firms, the construction equipment industry, and the traffic safety products industry in the District of Columbia and the Metropolitan Washington area. Contact MWRTBA Executive Director Mike Sakata, or visit www.mwrtba.org, to find out about upcoming events and more about membership.